Thoughts: Baldur’s Gate Enhanced Edition. A review of a rerelease of a 15 year-old game on Steam. What has the world come to? There’s plenty of old games on Steam these days. GoG has many of them cheaper and more easily moddable to work with newer operating systems, but Steam is the more appealing platform if you’re a developer/publisher both because of the large in-built audience and the DRM. This means it’s Steam which gets a lot of the XBLA HD rereleases like NiGHTs (which I will get around to downloading and playing one of these days), and it also gets Baldur’s Gate: Enhanced Edition1, an update of the original Baldur’s Gate (and expansion) to work on modern computers at modern display resolutions with a whole host of bugfixes and even some extra content. Oh, also they released it on the iPad because they like having a license to print money or something. 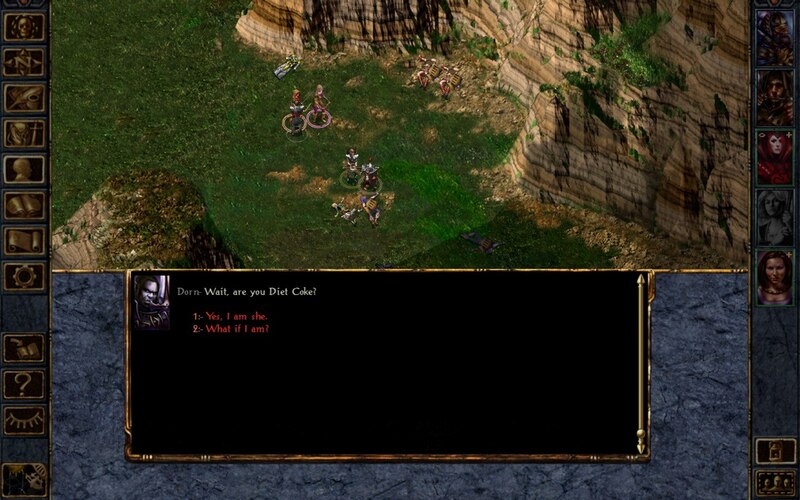 Now, an updated version of Baldur’s Gate doesn’t sound like an awful idea given that the original is one of the greatest RPGs of all time, but there’s two significant caveats with this particular execution of the concept. 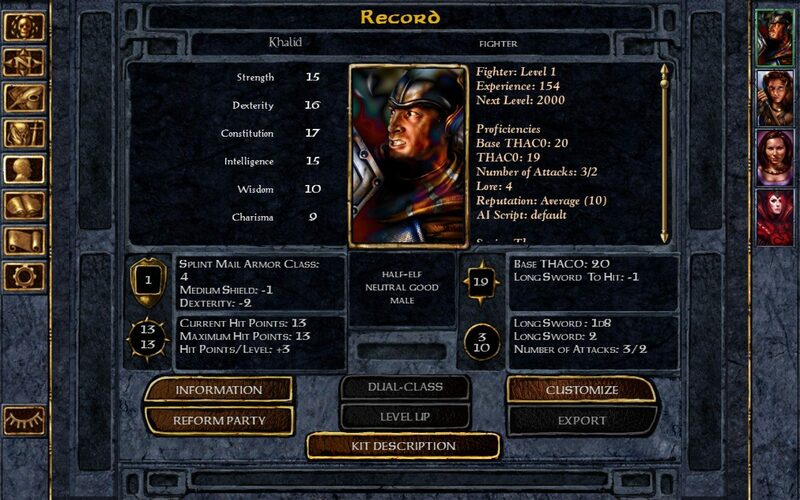 One is that many of the features in the update – the bugfixes and modern display resolutions – were already available in the form of mods for Baldur’s Gate and its sequel, most notably the Tutu mod which ported the whole thing into the Baldur’s Gate 2 engine. This means that if you have a certain baseline level of comfort with modding games2 and already own the Baldur’s Gate series you can get most of what the Enhanced Edition provides for free, and this is a rather significant consideration when you consider the other caveat, which is that they’re flogging this thing on Steam for a rather eye-watering £15. That’s a rather dear price for what amounts to a few new characters and the privilege of owning a Baldur’s Gate game on Steam; I’m not sure what the exchange rate is these days but I’m fairly sure that for £15 you could buy both BG and BG 2 on GoG and mod them to your heart’s content, neatly obviating any need to invest another £15 in the inevitable “enhanced” edition of Shadows of Amn. So that’s the main drawback to the Enhanced Edition, then; it may be an update of one of my favourite games ever but that doesn’t mean I’m blind to the fact that it is not a good deal unless you really want to play Baldur’s Gate on an iPad. While I appreciate that it’s a somewhat boutique product and the developers have to eat, I can’t really say that what you get for your money here is worth it, especially since there are still bugs in the goddamn thing. I’m not saying its riddled with them or anything, but you don’t get to advertise “over 400 bugfixes” when Kagain repeatedly asked to rejoin the party roughly once every second after I kicked him out, forcing me to put him down in order to continue the game. Or the crash to desktop when my player character got iced by the first assassin outside the Friendly Arm inn. Or any one of the other half-dozen CTDs I experienced in ten hours with the game. It’s not a perfect update by any means. An improved UI that attempts to render the second edition D&D rules on which Baldur’s Gate is based slightly less obtuse. I very much appreciated having detailed breakdowns of my party’s to hit rolls and damage values on the character and inventory screens, allowing me to instantly judge whether or not the +2 warhammer was going to be better than the +1 flail. A quicksave button in the main UI. More useful than it sounds, believe me. New hand-drawn animated sequences that replace the clunky 90s CGI of the original. These mostly fit into the game very well, although they get off to a bad start because the animation style is completely inappropriate for the game’s intro. Three new fully-voiced characters and associated sidequests that take place in brand-new areas of the map. One of the new characters is a monk, and low-level monks in 2nd edition D&D defy the laws of physics by both blowing and sucking at the same time so he’s never going to get used, but the other two are welcome additions to the lineup. Neera is a wild mage who is less annoying than every other mage in the game bar Edwin, and while that’s a very low bar to clear she manages it with aplomb. Meanwhile, Dorn il-Khan is a Blackguard with a natural strength value of 19. Again, you need to know D&D 2nd edition to understand just how completely broken this makes him as a character (except this time it’s in the fun direction), especially at low character levels where the damage bonus lets him instagib pretty much anyone he hits. He’s no slouch when it comes to dialogue and party responses, either. It’s this last point that comprises the bulk of the new content in the game; thanks to the very basic nature of the NPC characterisation in the original BG the new characters fit in more or less seamlessly, and it’s only the fact that they’re fully-voiced at all that marks them out as being different. The quests associated with them are workmanlike rather than spectacular, but they’re still a nice addition to the game. 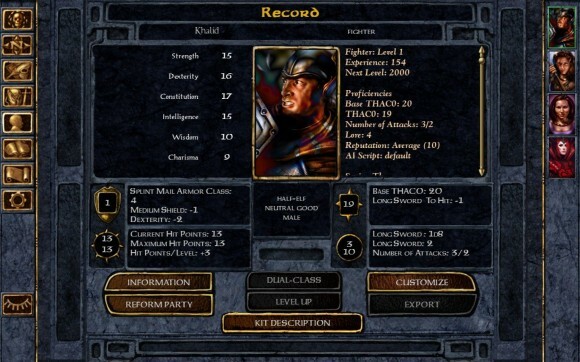 On the whole the new characters add a bit more life to what was by far the most lifeless portion of Baldur’s Gate, and I would have appreciated a few more of them instead of the inexplicable Black Pits challenge mode which takes place outside of the main game and is basically just combat combat combat. That sort of thing may be cheaper to make, but it’s completely missing the point of what Baldur’s Gate is. Otherwise it’s the same old story at a higher resolution3. There’s a whole host of minor cosmetic improvements like archmage Gorion doing more than just casting Magic Missile before Sarevok cleaves his head in twain, and the more powerful magic items having names and descriptions rather than just being a +2 variety of a longsword, and the odd new spell here and there, and probably a few more things that I missed (Baldur’s Gate is a big game, after all); it all makes for a much smoother experience compared to the clunky interface of the original. While I’m sure that my generally positive reaction is down to how much I like Baldur’s Gate rather than this Enhanced Edition being particularly good, I’m not exactly unhappy that I spent £15 on it. Your mileage may vary, though. Think of it as one of those collector’s editions where you spend an extra £10 for a badly-painted pewter figurine of a samurai and you’ll probably get along with it quite well. Just don’t treat it as an actual new game, though, because that’s the one thing this most definitely is not. Thanks for playing this so I don’t have to. There was always a trade-off, for me, in that the only purpose I could conceive of for this was new content, but the idea of adding new content to an already great game seemed abhorrent. If it doesn’t add much then I feel like I may as well give it a miss. It’s definitely only for people who really, really like Baldur’s Gate. And those people probably already have it modded with Tutu anyway. I don’t think I could replay BG/BG2 again anyway. I can’t say that I am enamoured with it all that much. This is the man who wanted me to buy Dead Space 3. I enjoy a great variety of stuff. Variety is nice. I always found BGT to be a bit wonky, although that was a much earlier version (I think before it even got converted to Weidu). If/when I go back to it I’ll probably stick to Tutu. I used Trilogy a few years ago and it was fine.